D.W. Griffith rules the year with two of his finest films: both tender, but in different keys. 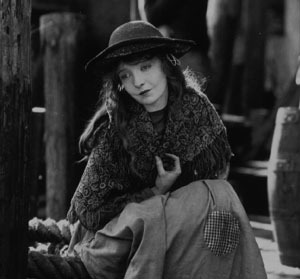 Broken Blossoms is an acknowledged classic, a high-pitched drama about an abused girl (Lillian Gish in a performance for the ages) who finds kindness from a Chinese gentleman (Richard Barthelmess) in the slums. If you know that film, consider True Heart Susie, a lesser-known gem that puts Gish as the next-door neighbor to farmboy Robert Harron, in a sentimental story that also pokes gentle fun at its sentimental conventions. A list going back this far is limited by availability of titles and the murkiness of pre-1920 silent inventory. But all of these are interesting: South is the account of the Shackleton expedition, and incredible for its very existence; Madame Dubarry is cheeky history that helped put Lubitsch on the world stage; The Hayseed is Fatty Arbuckle and Buster Keaton in a series of nice gags (Keaton was about to go solo). Sunnyside is a scattershot Chaplin two-reeler that goes up a few notches for the sequence in which the day laborer goes on a bucolic dance with wood nymphs, a truly Shakespearian interlude and a crazy autobiographical daydream on the part of the director/star. (Chaplin’s other 1919 release, A Day’s Pleasure, has some funny gags but is similarly random.) Different from the Others is a fascinating (and no longer complete) plea for tolerance of homosexuality in an era when gayness was illegal in Germany, with a tortured performance by Conrad Veidt. Next he would star in The Cabinet of Dr. Caligari, and the course of film history would change.